Step 1 Wash the potato and pat dry. Poke with fork 4-5 times on both sides. Step 2 Place on a microwave-safe plate and microwave on HIGH for 5 minutes. Use oven mitts to flip the potato and microwave an additional 3 minutes. Remove from microwave and set aside. Step 3 While the potato is cooking, mix together the ricotta and pesto in a bowl. Step 4 When potato has cooled enough, split open the potato and stuff in the baby spinach leaves. Top with the ricotta-pesto mixture, and enjoy. 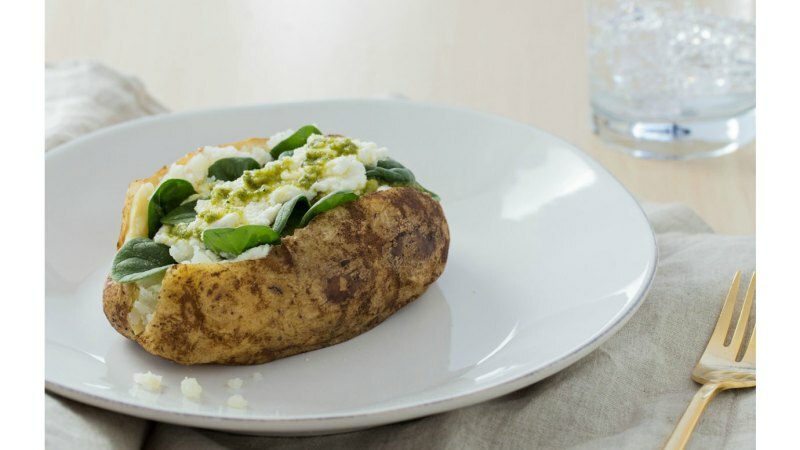 Carb up pre-workout with this energy-boosting spud. If you’re looking for fewer calories, than half the potato works perfectly, too. For a creative spin, use sun-dried tomato pesto instead of basil pesto. You can also swap the cottage cheese for ricotta cheese, or cut it altogether if dairy upsets your stomach and you want less fat.